On the evening of 5th December 2018 thirty incredible women graduated from a ten-month programme of self-discovery, transformation and leadership training. What the women did not know before that day is that the Ngāi Tahu iwi had made an incredibly generous and symbolic gift of a piece of te wai o Pounamu for each of the cohort, on the occasion of their graduation. Aroha Hōhipera Reriti-Crofts CBE (Ngāi Tahu/Ngāi Tūāhuriri) and other representatives from Ngāi Tahu travelled from Christchurch to Auckland to attend this very special graduation and gifting ceremony. Global Women recognises this moving gift as symbolic of the women’s leadership roles across New Zealand. It also highlights Ngāi Tahu’s confidence and support of them as leaders and the special relationship between Ngāi Tahu and Global Women. Cut from one single block, these 30 pieces will be forever connected through their origin and will provide a continuous bond between the cohort as whānau. At the same time the pieces were chosen with care for each individual woman, to reflect her unique personality, strengths and contributions. 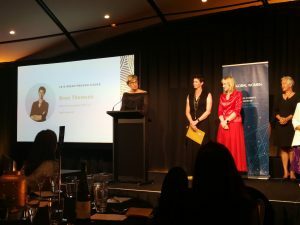 Global Women and the 2018 Breakthrough Leader Graduates greatly appreciate this significant taonga and what it represents about the programme, Global Women and the graduates individually. Thank you.